Worldwide distribution: Native to north-eastern and north-central North America. Invasive plant in many parts of Europe, Japan and China. Local distribution: Widespread in England, less so in Wales, Scotland, Northern Ireland and Ireland. Habitat: Roadside, wasteland and canalside. Foraging season: Blossom late summer. 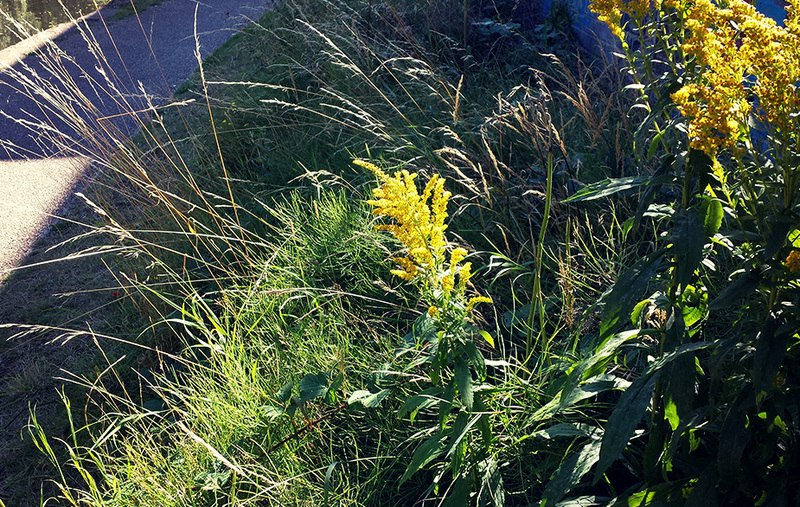 Introduced as an ornamental plant from North America, Canadian goldenrod is now a very common sight in England, as the plant rampantly spreads into vast carpets on riverbanks and wastelands alike. There is also a native European goldenrod (Solidago virguarea), which is common and widespread throughout Britain and Ireland. 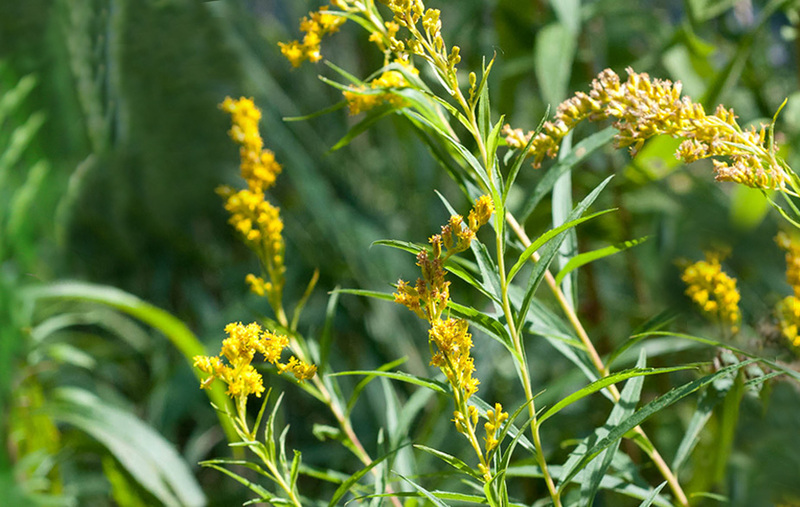 Goldenrod goes unnoticed most time of the year among the green grasses and displays beautiful yellow pyramid clustered flowers on late summer, highly attractive to bees and butterflies. Different species can be difficult to distinguish to the untrained eye, as they all have very similar bright yellow flower heads and hybridise in the wild. 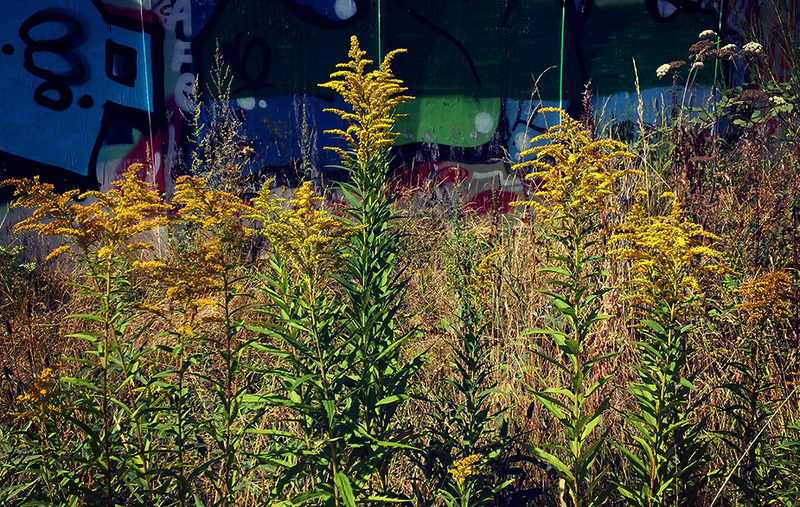 There are lots of articles on internet unfairly blaming goldenrod for seasonal allergies. That is because is commonly mistaken with ragweed, a plant usually found in North America, but rarely found in Britain and Ireland. The dried flowers and young leaves can be used on medicinal teas and infusions, though flowers look great for presentation purposes. The blossoms are analgesic, astringent and febrifuge.